These pages provide information on the maximum reliable speed for various Macs. This can vary from one machine to the next. Chipping is not authorized by Apple. Any modifications you perform on your Mac may damage it. Modifications are done at your own risk. The Quadra 605 has a 25 MHz 68LC040 processor, which is a 68040 CPU without an FPU. Replacing the LC040 with a full 040 will improve performance. Rather that using an oscillator, the 605 uses a clock generator set at 25 MHz. By modifying settings of four surface-mount resistors, you can change the speed to 20, 33, or 40 MHz, as detailed on Q605 (LC475, P475, P476) Speedup. The 25 MHz Quadra 610 replaced the 20 MHz Centris 610 and uses the full 68040 CPU, not the FPU-free 68LC040 version. The oscillator runs at 12.5 MHz and the CPU at twice that internally, 25 MHz. Using a 14.7456 to 15 MHz oscillator will boost speed to 29.5 to 30 MHz while allowing the serial ports to continue to function properly. If you don’t need to use the Mac’s serial ports, you can over clock the 610 to 37 MHz with an 18.5 MHz oscillator. You can drive a Quadra 610 with DOS card to 34.9 MHz using a 16.96 MHz oscillator. 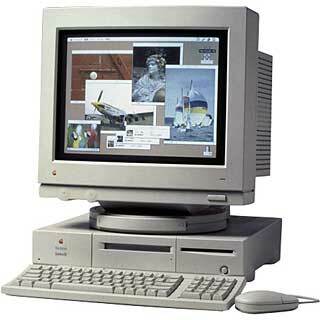 The 33 MHz Quadra 630, along with its Performa and LC siblings, was a huge hit in schools, with its compact design, room for a CD-ROM, and optional video I/O, TV tuner, and DOS card. Like the Quadra 605, it uses a Clock Generator rather than an oscillator, and speed can be adjusted using resistor pads on the logic board for speeds of 25, 33, and 40 MHz. See Q630 (LC630, P630, P631, P635, P636, P638, P640) Speedup for details. The Quadra 650 has a 16.667 MHz oscillator which runs the processor at 33.33 MHz. The fastest oscillator you can replace it with while keeping the serial ports functional is 22 MHz, to run the processor at 44 MHz. If you don’t need to use the serial ports, you can put in a 24 MHz oscillator, to run the processor at 48 MHz. For those using Apple’s PPC card, stick with a 19.6992 MHz oscillator and 39.4 MHz CPU speed for compatibility. Info from Machine Specifics. Also see the parts list. The Quadra 800 has a 16.67 MHz oscillator which runs the processor at 33.33 MHz. The highest speed oscillator you can replace it with while keeping the serial ports functional is 21 MHz, to run the processor at 42 MHz. If you don’t need to use the serial ports, you can put in a 24 MHz oscillator and run the CPU at 48 MHz. With an Apple PPC card installed, the maximum oscillator you can use is 19.286 MHz, to run the 68040 at 38.572 MHz and the PPC card at 77.144 MHz. The Quadra 900 has a 50 MHz oscillator that runs the processor at 25 MHz. The fastest oscillator you can replace it with is 74 MHz, to run the processor at 37 MHz. The Quadra 950 has a 66 MHz oscillator which runs the processor at 33 MHz. The max oscillator you can replace it with is 92.9405 MHz, to run the processor at 46.47025 MHz. With an Apple PPC card installed, the max oscillator you can use is 80 MHz, which will run the 68040 at 40 MHz and the PPC card at 80 MHz.